Are you suffering from frequent sinus headaches, pain in the forehead or between the eyes? Do you keep getting sinus infections? Are you looking to avoid surgery on your sinuses? Have you tried various treatments and not had any relief? Osteopathic Manipulative Treatment (OMT), the all-natural alternative, may be the answer for you. Nasal sinuses are hollow, air containing cavities in the skull behind the forehead and cheeks of the face. There are four pairs of sinuses and these are referred to as the paranasal sinuses. Sinusitis occurs when one or more sinuses become infected causing inflammation of the membranes that line the sinus cavity. Most cases of acute sinusitis start with a common cold, which is caused by a virus. People who suffer from allergies that affect the nose (like pollen allergy, also called hay fever), as well as people who may have chronic nasal symptoms not caused by allergy, are also prone to develop episodes of acute sinusitis. Rarely, fungal infections can cause acute sinusitis. Drainage of sinus cavities is not only accomplished by gravity, but it also requires normal bone motion, functional ciliary motion, and free flow of mucus. 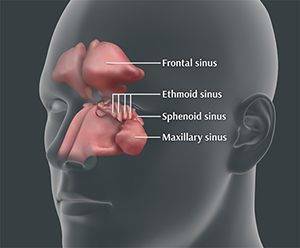 Ethmoid and maxillary sinuses are present at birth; frontal and sphenoid sinuses do not appear until age 8 to 10 years. Compression of the head during delivery or from postnatal trauma can encroach on the size of the sinus cavities and interfere with normal drainage. Chronic sinusitis often occurs in people with asthma, the majority of who have allergies. 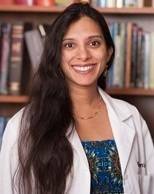 Another group of people who may develop chronic sinusitis are those with significant anatomic (structure) variations inside the nose, such as a deviated septum, that leads to blockage of mucus. In general, people who have reduced immune function (such as those with primary immune deficiency or HIV infection) or abnormalities in mucus secretion or mucus movement (such as those with cystic fibrosis) are more likely to suffer from sinusitis. One of the most common symptoms of sinusitis is sinus pain, and the location depends on which sinus is affected. If you have a pain in your forehead over the frontal sinuses when you are touched, your frontal sinuses may be inflamed. If your upper jaw and teeth ache, and your cheeks become tender to the touch, you may have an infection in the maxillary sinuses. If you have swelling of the eyelids and tissues around your eyes, and pain between your eyes, you may have inflammation of the ethmoid sinuses that are near the tear ducts in the corner of your eyes. If you have earaches, neck pain, and deep achiness, you may have infection in the sphenoid sinuses, although these sinuses are less frequently affected. In addition to the pain, people with sinusitis frequently have thick nasal secretions that are yellow, green or blood-tinged. Sometimes these secretions, referred to as post-nasal drip, drain in the back of the throat. Acute and chronic sinusitis is strongly associated with nasal symptoms such as a stuffy nose, as well as with a general feeling of fullness over the entire face. Less common symptoms of sinusitis can include tiredness, decreased sense of smell, cough that may be more severe at night, sore throat, bad breath and fever. Medications: Your doctor may use antibiotics, antivirals, or antifungals, depending on the cause of the sinusitis. Associated exacerbations of allergies and asthma will be treated accordingly. Over-the-counter or prescription decongestant nose drops and sprays should be used only for few days. If you use these medicines for longer periods, they can lead to even more congestion and swelling of your nasal passages. Saline (saltwater) washes (like the neti pot) or sprays in the nose to help remove thick secretions and allow the sinuses to drain. Surgery may be recommended when all conservative treatments do not work. Click here to read a patient testimonial from someone who was having chronic sinus problems and was treated with OMT.